Even as tanneries in Kanpur are partially shut for ensuring clean water in downstream Ganga during the ongoing Kumbh 2019 at Prayagraj (Allahabad), the Dutch government plans to invest more than 2 million euros in the Kanpur leather cluster. The investment is aimed at helping the beleaguered 150-year-old Kanpur leather and tannery cluster treat effluents being currently discharged into river Ganga. Yesterday, a high level Dutch delegation had visited Lucknow and confabulated with Uttar Pradesh chief secretary Anup Chandra Pandey regarding various joint projects underway in the state, including the proposed investment of €2 million in Kanpur. Primarily, UP comprises three major leather clusters, including Kanpur-Unnao, Agra and Noida. 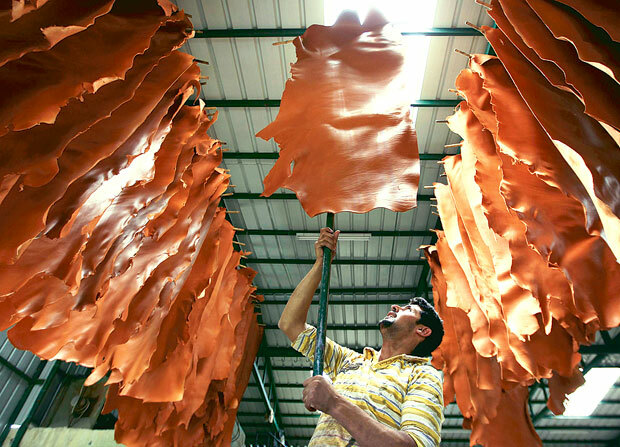 Of the Rs 20,000 crore annual UP leather industry, about 50% is accounted for by the export market, while the state collectively accounts for a third of India’s leather trade and exports. Kanpur leather cluster, also comprising the nearby Unnao district, is the biggest hub and estimated at Rs 12,000 crore, including Rs 6,000 crore worth of exports to the Gulf, Europe, China, Iran etc. It provides direct and indirect livelihood to almost a million people. However, owing to the Kumbh, the Yogi Adityanath government had ordered the closure of all tanneries in Kanpur for 3-4 months starting December 15 for curbing the discharge of effluents in Ganga. In all, 249 tanneries located in Jajmau area of Kanpur were asked to shut down. The projected loss to the tanneries was estimated at Rs 3,000 crore apart from massive loss of livelihood and key export markets. The local tanneries had challenged the closure order in court and later the UP Pollution Control Board (UPPCB) had allowed them to operate at 50% capacity till Kumbh was underway. Pandey has directed officials to expedite the implementation of proposals as laid down in the memorandum of understanding (MoU) signed with the Netherlands in the fields of agriculture, dairy, water management and environment. Meanwhile, the €2 million would be injected in Kanpur through Dutch NGO Solidaridad and a consortium has been constituted comprising Solidaridad, PUM (Dutch senior management expert program), STAHL (Dutch leather chemicals major), UP leather industry association, small tanneries association and Ganga Pollution Control Unit. Central Leather Research Institute (CLRI) has been roped in as the technical partner in the consortium. Under Namami Gange and National Mission for Clean Ganga (NMCG), both the central and state governments have reiterated that Ganga should be completely freed of pollutants and discharge by 2022. Of the total projects worth over Rs 20,000 crore under MNCG so far, the Centre has approved projects worth almost Rs 9,000 crore for UP alone. Earlier, Kanpur-based Tasty Dairy Specialities Limited had collaborated with a Dutch consortium for setting up a dairy excellence centre INDUCED (Indo-Dutch Centre of Excellence in Dairying) in Kanpur.